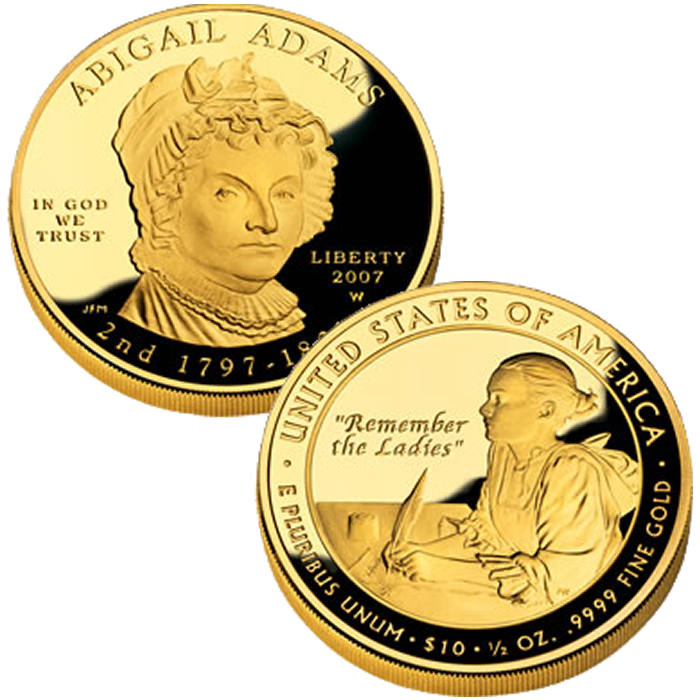 The 2007-W $10 Abigail Adams First Spouse Gold Proof Coin marked the second coin of the series to be released honoring the spouses of the former Presidents of the United States. Abigail was married to John Adams, the second President of the United States, which explains why this coin was released second in the program. All of the coins are issued in the order upon which the associated President served. First Spouse Gold Coins are all struck from 1/2 ounce of .9999 fine gold to either proof or uncirculated condition. If a President served while unmarried, the authorizing legislation directs the Mint to use an image of the mythical figure of Liberty instead of a spouse. This is the case for the above Jefferson’s Liberty as Thomas Jefferson’s wife had passed away nineteen years before he assumed the office of President. 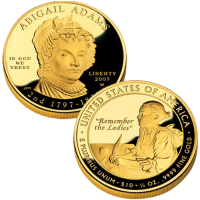 Initial price on the Abigail Adams Proof Coin was $429.95. Designed and sculpted by Joseph Menna, the obverse (heads side) shows a regal portrait of Abigail Adams. Abigail is shown writing a letter to husband on the reverse (tails side) of the coin. It was designed by Thomas Cleveland and sculpted by Phebe Hemphill.